There are many existing tools which can be helpful during reporting. Starting with simple back-office tools all the way up to domain systems managing EHS, GHG or just additional ERP modules. None of those tools, however, will carry you through the whole report lifecycle. Diaphane is different. It is a dedicated tool built from ground up for a single purpose: to help you manage and communicate CSR/ESG aspects. 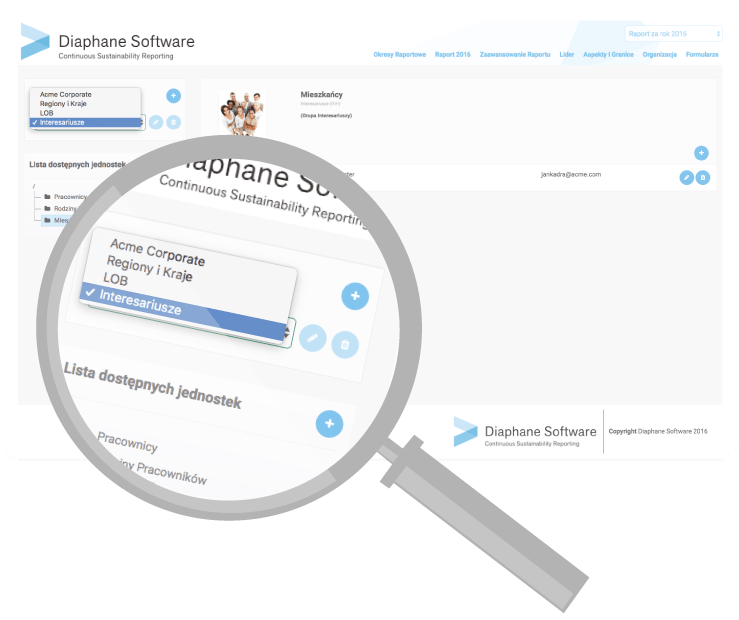 Diaphane is the last non-financial reporting tool you will ever need. Diaphane is delivered with process documentation and readily available content to help you plan the reporting process from day one. We can also provide consulting services to kickstart the process in the first year. It is our commitment that everything will be running smoothly regardless of how much experience you have had with non-financial reporting. Diaphane does not limit the number of people that you can grant access to the platform. This includes external stakeholders – identify and engage them in meaningful, asynchronous, bidirectional communication and understand where their priorities are. Once you know which aspects are material and worth reporting on, Diaphane will automatically find right questionnaire templates for you. Collect data in a predictable and manageable process. Demonstrate audit trail. Proactively remind reporters about coming deadlines and automatically escalate the deadlines they miss. Use visual heatmaps to understand the risk of not getting the data on time. Analyze data as it is being collected. Observe yearly and year-over-year trends. Manage any change that should occur to make sure that when the reporting time comes, your data will shine.